Melissa Ayr Unveils "Be Ruinart"
Melissa Ayr is a colorful contemporary abstract painter whose work incorporates high energy, fluidity, growth, and life. Melissa Ayr’s art has hung in the Guggenheim Museum in New York, and her art resides in homes of high profile collectors. Earlier this year, Melissa was featured with a solo exhibition “Ocean Drive” as part the Celebrity Super Bowl Charity Bash in Miami Beach. 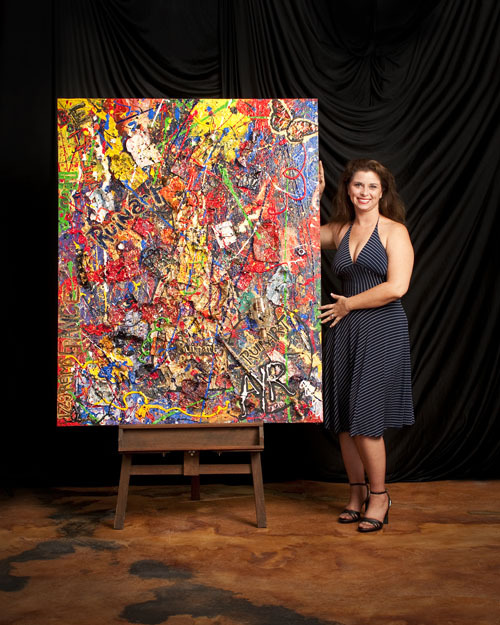 Last year, Melissa was featured as the only American Artist at the 2009 World Wilderness Congress with her ground breaking “Wild Thing” painting that raised awareness and funding for the Wild Foundation and Jane Goodall. The night the piece was unveiled Ms. Ayr shared thoughts about “Be Ruinart”. “I was asked to create my interpretation of what Ruinart champagne would look like as a contemporary art piece. I was given a bottle to enjoy and sit alone with my thoughts.” “The name Ruinart was something that caught my eye; ‘art’ being in the name of the champagne itself. How could this champagne, art and the excitement built up within be combined and conveyed on a canvas?” Ms. Ayr stated that as she opened the bottle, the Champagne cork popped and champagne spilled out. Melissa took this into the studio and used paint tubes spilling out of the bottle onto the canvas to convey an explosion of art. Ms. Ayr was inspired to use paint tubes in “Be Ruinart” because of a story about Picasso. While living in Lake Tahoe, Ms. Ayr had an opportunity to work with DA Russo, a student of Pablo Picasso. He would speak of his time living with Picasso in France when he was a young boy. According to DA Russo, Picasso was known for keeping the left over tubes of oil paints his students discarded. He had a box near the door of the class where the students would dispose of them. When the box was filled Picasso would snip off the ends of the tubes, butterfly the tubes and then use the remainder of the paint that was left inside for his own art. “Be Ruinart” is a Louis Vuitton Moët Hennessey commission with a mission. “Be Ruinart” will be represented at Art Basel Miami in December 2010 and then auctioned off in New York in January 2011. The painting will benefit the Museum of Arts & Design in New York with 100% of the proceeds donated to the Museum for their education programs. To find out more about the “Ayr Art Transformation Tour” and artist Melissa Ayr visit http://www.melissaayr.com. Melissa Ayr Presents “Ocean Drive” Exhibition at the Super Bowl Charity Bash. This event will be held at the Proof Restaurant (owned by All-Star Pro Bowler Ricky Williams) in Miami Beach inside the Z Ocean Hotel. Join Melissa for the Art Exhibition on Saturday and Sunday. Sat Feb 6th 5pm to 9 pm. Sun Feb 7th 5pm to 2am. Join us Super Bowl Sunday for the All-Star Celebrity Super Bowl Charity Bash! Meet Melissa Ayr & get autographs from your favorite current and former NFL Players. This is the place to be in Sobe for Super Bowl 44! The proceeds from the event will raise money to build a community resource center in Haiti.